Photo Above: Ashleigh using the DBI Sala 100’ rope self-rescue pack to lower herself to the ground after a simulated fall. Ashleigh using the Ladsafe system to climb the platform. 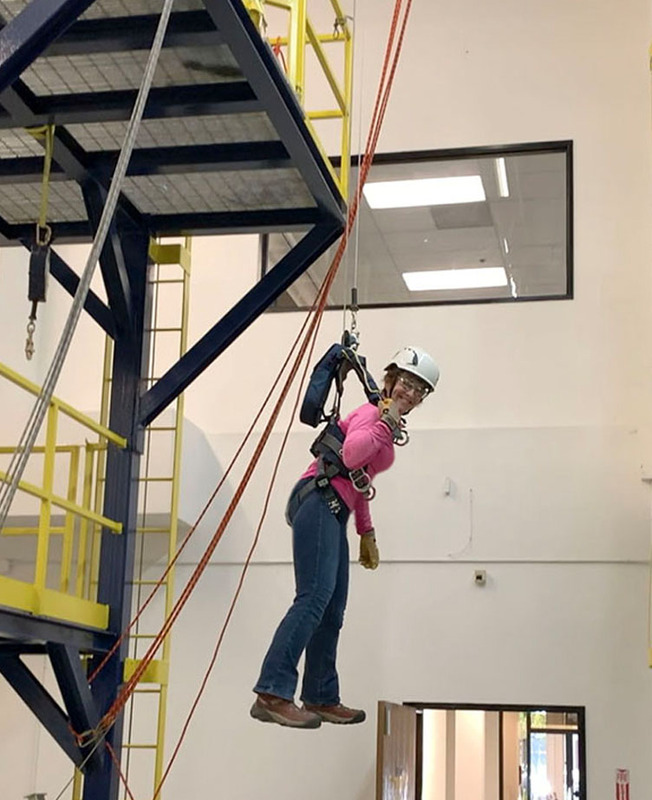 Ashleigh Oliver, one of our Alaska-based safety professionals, recently attended 3M’s week-long Fall Protection Competent Person Trainer Course in Tustin, California. Trace Savage, 3M Alaska’s Fall Protection Manager, donated the course on behalf of 3M as a raffle prize for the 2018 ASSP Alaska Safety Summit – and Intuitive Safety Solutions won the drawing! 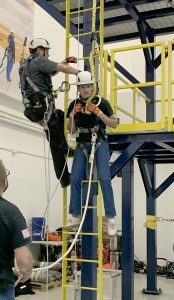 Ashleigh jumped at the chance to refresh her fall protection training. 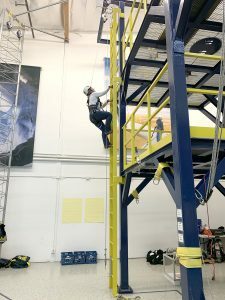 Although she had earned a Gravitec 40-hour fall protection competent person/tower climbing certificate during her work in the ConocoPhillips Alaska oilfield, she wanted to update her skills and regulatory knowledge. “It had been ten years since I’d attended the Gravitec course. Regulatory knowledge and equipment change over time – I always want to ensure I stay current. Our instructors, Tim Metzger and Tim Schenck, are top notch professionals with a wealth of practical experience as firefighters and rescue team members. The course was excellent”. Ethan Hachey, Safety Director for Moe Plumbing Services, acts as the victim for rescue practice during the course. 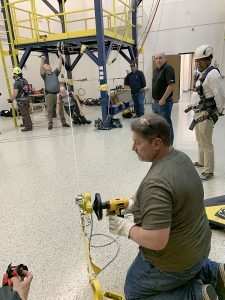 Steve Elkner from Hensell Phelps using the 3M DBI Sala R550 controlled descent rescue device with the drill adapter that allows rescuers to use a mechanical advantage when raising a victim (Compatible with most ¼ inch cordless hand drills). The system can also be used as an escape device or for pick-off rescue. Even though this was a refresher course for Ashleigh, this experience was well worth the time to attend. It was definitely a win, win for everyone!